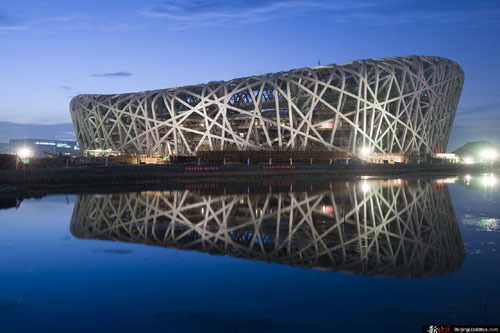 Picture Show: Construction of the world largest "Bird's Nest"
Report: China Issues Broad Olympic Ban. AP Nov.9. China's best set to meet for first time in NBA. Rocekts.com Nov.8. China dismisses Olympics Bible ban as rumors. Xinhua Nov. 8. Photo taken on Aug. 24, shows the fireworks of the Beijing 2008 Olympic Games closing ceremony in the National Stadium, or the Bird's Nest, Beijing, capital of China. The building on the left is the National Aquatic Center, or the Water Cube. The closing ceremony began at 8 p.m. sharp on Sunday. (Xinhua Photo) Click for more about information about 2008 Beijing Olympics. Facts and Figures about the Olympic "Bird's Nest"
20 billion yuan has been spent on Olympics related preparation. 400,000 number of students enrolled in sport schools.